Mandy has been teaching in the Fitness Industry for over 18 years and decided to focus on teaching yoga in 2018. She has been teaching retreat holidays since 2017. 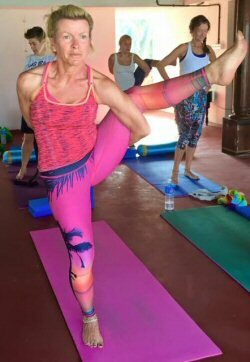 Her passion for yoga started when she attended her first class in the local church hall in her home town of Buxton, Derbyshire when she was 16. Mandy teaches Vinyasa flow but during the retreat will introduce other elements of yoga such as Yin and Restorative. After a 19 year career in the Civil Service Mandy explored the idea of becoming a Pilates teacher. A year later she qualified to teach not only Pilates but Aerobics, Step, Aqua, Body Balance and Body Pump and this has been her “very enjoyable” work since 2000. Mandy has been practising yoga regularly for over 10 years and has attended many retreats. She trained to teach yoga with Claire Murphy; “probably one of the most challenging, fun, bonding and enlightening experiences of my life.” She has since trained in Yin and Restorative Yoga. She attends yoga workshops and training days regularly to update her teaching methods. As she has become more experienced in her teaching Mandy has noticed the changes in her own body and those who attend her classes. She is always looking to broaden her knowledge particularly when people have injuries or chronic conditions and passes this information on to her students. During her classes she guides her students through a series of poses and works towards a pinnacle pose. Our morning practice will usually start quietly with centring and Pranayama, we will then move into a themed, alignment based Vinyasa Flow practice. Each session will close with meditation and relaxation. Our evening practice will be more varied. Some sessions will be playful with partner work; others will be slow flow, Yin Yoga, Yoga Nidra or Restorative Yoga. "My philosophy on Yoga as in life is work hard to get results, enjoy life and have fun!, Namaste"
You did a brilliant job facilitating & teaching the Yoga Retreat. I liked starting with sitting & the Anusara prayer -- a good way to anchor each class. The poems you read out were inspiring. In fact, your structuring was perfect -- a more vigorous class in the morning working towards a challenging posture and then variety in the afternoon-- I personally really like partner work -- people get to know each other & learn in a different way. Great to finish with a Yoga Nidra -- though I prefer the more traditional one that rotates the consciousness around the body in a specific way, starting with the right hand thumb -- that order does something to the brain that works for me. I felt very comfortable with your directions & confidence in teaching -- nothing you did made me nervous -- you knew what you were doing & we could relax. Thanks for a great time!